This section of the web-site relates to making card models for rest and relaxation, at times it can even be for fun and sheer escapism. The examples shown in this section are all from the WPCCC range and grateful thanks are given to Keith Hunt of WPCCC for the information supplied. Additional details of my modelling can be found by following the links to the left hand side of this page. Locomotive shown is Russell. A 2-6-2T engine currently under restoration at the Welsh Highland Railway. Built to work in N Wales the loco had a varied service life and for a short time after the 2nd World War ran on a line at Norden in Dorset. Withdrawn in 1953 and preserved in 1955 . 'Phone orders - ring 01 766 513402. 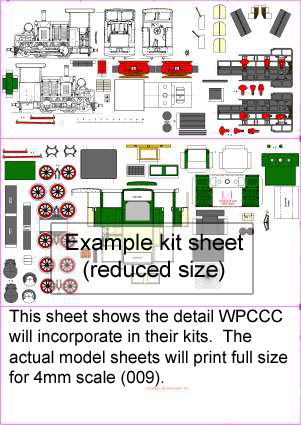 As further models are developed in the WPCC range, and the kits near release, additional photographs relating to the WPCCC range of kits and models under construction will be added to Keith's fotopics album section at http://keithhunt336.fotopic.net/. An option to motorise this kit for Russell is by using a ready to run ROCO chassis. 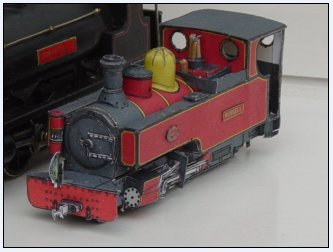 Details of how this has been done with a brass kit version of Russell are available on the web site describing the inspiring County Gate layout of John and Jenny de Frayssinet which is loosely based on the Lynton & Barnstaple Railway. It is cost effective relative to other hobby materials, it is easy to work with, versatile, and needs little specialist equipment. Card is a strong and much underrated, wonder material when used in conjunction with modern glues and tools. With these it can be swaged, dished, moulded, burnished, bent and reinforced in ways that are impossible with plastics and metals. It can also be easily and cheaply repaired - and the WPCCCo's models require no painting. All come fully lined and liveried - and a quick rub with an ordinary HB pencil soon masks all those tell-tale white edges. Model making needs to be enjoyable and at the same time be satisfying. In the early days of railway modelling card was a staple part of the hobby. In recent times the established trend has been for greater and greater accuracy with the consequence that kits have become ever more complicated, ever more expensive, and a therefore a deterrent to many modellers. Card offers the opportunity for changing that. Have a go, take up card model making, you won't regret it. Keith's kits are designed in a way that includes many small fittings that an experienced card modeller can add to the models but if a beginner makes the kits and chooses to leave them off the first time that doesn't negate the pleasure in making the model. Two chassis options will also be offered too on several models in the range - an easi-build and fully detailed version even featuring inside valve gear. I have said the first time deliberately; with a card kit a second or third go at a model is cost effective unlike, for example, an etched brass kit, costing over a £100.00 a time. Card modelling offers you the opportunity to build small models. use simple inexpensive tools and all without breaking the bank. In card you can buy several models and go back for another try as your skills improve. See also my gallery collection of railway photographs. If any reader has any doubt about the quality that can be achieved with card as a modelling medium the buildings on the Pendon museum layout will put those doubts fully to rest. A further advantage of working in card is that commercially produced printy sheets, or textures, can be employed and some are available for free download on line. The textures site I was using in 2007 when I built Pebbles End was Mayang Textures. However this was off-line for some time due to technical issues with a server although I am happy to report (Feb. 09) it is back. During the down time of Mayang I also found a similar, and arguably better, site (GTextextures.com) which can be found here. You can also make your own printy sheets from your own photographs and other artwork. The locomotive featured is Moelwyn. Now on the Festiniog Railway running as a 2-4-0 it was originally built by Baldwin in 1918 as a petrol 0-4-0 for service with the French Army in WW1. It was bought by the FR in 1925. During the early preservation years it was converted to petrol with the additional carrier wheels added to aid stability.